Wong Fei-Hung is one of China’s greatest heroes, the subject of dozens of martial arts films, played by many actors, but the talents of Tsui Hark, Yuen Woo Ping and rising star Jet Li came together to tell what has become the quintessential Wong Fei Hung film series. The film opens as we meet Wong Fei Hung (Li) as he stands aboard a Chinese ship watching a lion dance that is interrupted by an American ship that opens fire on them, mistaking the fireworks as an attack. Wong Fei Hung is forced to jump in to finish the lion dance, and afterward the General,called to Vietnam, charges Wong Fei Hung to train his remaining men as militia to defend China from foreign invaders. Some time after that Wong Fei Hung comes face to face with Aunt Yee (Kwan) who has just returned from America, a stunningly beautiful woman who is not a blood relation of Wong’s, and she is smitten with him immediately. Even back home in China she still dresses as she did in America. While they get reacquainted, circus everyman Foon (Biao) shows up at Po Chi Lam, Wong Fei-Hung’s home and dojo, and wants to learn Kung-Fu as to gain a courage and self respect he lacks, and has problems understanding Wong’s student Bucktooth So (Cheung), who has also been assimilated while he stayed in America, to the point where he barely speaks Chinese and can’t read it, which makes other treat him as an idiot, when the reality is he’s probably the smartest person in the film not named Wong Fei-Hung. Once Upon a Time In China has to be considered Tsui Hark’s masterwork. The story is dense and well done, and we get scenes that really show how the westernization movement is changing China, from the christian priests who roam the streets trying to convert the people to the clothing worn by Aunt Yee and Bucktooth So, and how Wong Fei-Hung is resistant to this kind of change. Many Hong Kong films, especially those of the 80’s and 90’s portray westerners as big thuggish oafs or just plain evil people. This film somewhat counterbalances this with a particular priest who sacrifices himself to save Wong Fei Hung. The side story with Foon, as he discovers what true bravery really means, is just as important as anything else in the story, and adds to the tapestry. Jet Li shines in what I believe to be his best role, as he brings a dignity and grace to Wong Fei Hung, and his stillness, especially in scenes where chaos seems to rain down on him. Jet has never been a great actor, but he does a fine job here. Rosamund Kwan is also great as Aunt Yee, as she creates a great counterpoint to Wong Fei Hung, and the scene where he scolds her after Po Chi Lam burns is great scene, as she shows how much his words truly hurt, and also the scene where she tries to keep herself from being raped by one of the villains. Her terror and defiance are written all over her face, and Rosamund pulls it all off spectacularly. Yuen Biao has one of the best character arcs as Foon. He goes from clumsy knucklehead to loyal servant to realized what’s truly important to him, allowing him to become the hero he didn’t know he could be, kung-fu or not. Jackie Cheung is just as great as Bucktooth So, and I think he has the best single acting moment in the entire film in a scene where, just after the theater massacre, Wong Fei Hung is trying to heal as many as he can, and calls for So to get the medicine, but when Bucktooth So tries to do so, the medicine jars aren’t written in English, and the man Fei-Hung tried to save dies, and Bucktooth So succumbs to his misery and despair as he couldn’t help save the man–simply because he couldn’t read Chinese. What a great and yet sad scene. 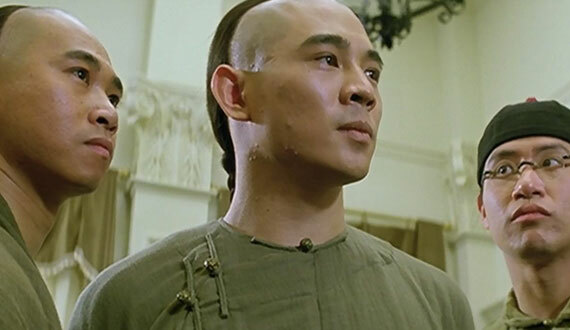 Yuen Woo Ping does a masterful job of choreographing the fights, particularly the two fights between Wong Fei Hung and Master Yim, and the umbrella fight in the tea house is fantastic as well. The theater fight has to be among one of Woo Ping’s best fight scenes and certainly may be one of Jet’s. The fights using spears, swords, and hand/foot work is breathtaking in its speed and beauty (most of that coming from Jet) and the final fight with Master Yim using bamboo ladders is terrific. There are a lot of fights in this film, and each one is distinctive and flows as part of the story. Some of the fights are light-hearted while others are more brutal, but they never lose the gracefulness of Woo Ping’s dance-like choreography. You can read a very well done analysis of the fight choreography from my friend Dangerous Meredith’s site here. CHOREOGRAPHY: (10) Woo Ping does some of his best work here, and all of the performers are up to the task. Jet Li has never looked better. Yuen Biao also does tremendous work as does Yen Shi-Kwan. STUNTWORK: (9) Truly outstanding work by the stuntmen. There are fights involving many onscreen at the same time, and they do a great job of reacting to the fight choreography brilliantly. STAR POWER: (10) Jet Li’s career flies into the stratosphere with this film, and Yuen Biao is great as well, and add Rosamund Kwan and Tsui Hark and Woo Ping…greatness. FINAL GRADE: (10) Once Upon a Time In China is without a doubt one of the best martial arts films of all time, and may represent Jet Li and Tsui Hark’s best work. The sequels are good films as well, but the first is still the best. DM, your breakdown of the fight choreography in OUATIC is fantastic, as are all of your analysis, so I would do so anytime!